After registering, you will receive an RBZ file and a unique license key. Go to Window > Extension Manager > Install Extension > Choose the downloaded RBZ file. A new toolbar called FlexTools will appear. If you have the latest FlexPack installed, you already have ComponentFinder! Minh Tran from Architecture Inspirations did an excellent job explaining how to use ComponentFinder. The Toolbar when only ComponentFinder is installed. The Toolbar when ComponentFinder is installed along with FlexPack & WallCutter. Choose a folder from your hard disk. A new folder pane will be created showing you all the components in that folder. Select multiple folders at once, and multiple panes will be opened! Click on any component thumbnail and place it into your model. See all the components in the current folder and in all of it's sub folders and in their sub folders... (5 levels deep). The familiar browsing view of folders and components. Go in and out of folders. Enter a search phrase. Components matching your phrase will be filtered as you type. Show smaller and larger thumbnails. If you've made some changes to a component and you want to save it for later use. Select the component and click on the blue [+] button to save it into any of the open folder panes. Click to show the original folder that the current folder pane is pointing to. If you've made file and folder changes in Windows Explorer/Mac Finder, you may need to refresh ComponentFinder's folder panes. Click to refresh. This will open a new folder pane pointing to a folder where the right clicked component is located in. Use case example: Let's say you have a folder called People. In that folder you have another folder called People-3D and a lot of other folders with all sorts of people. You open a ComponentFinder folder pane that is pointed at People. It's set to Flat File View since you want to see ALL your people in one place. You mission now, is to save a 3D dude from your currently open model into the People-3D folder. If you were to click on the blue [+] button, the save dialog would open into the root folder (People) - Probably not where you want to save your lovely 3D dude to. Instead, right click on another 3D dude that is already in the currently open folder pane. Choose to 'open it's containing folder' in a new folder pane. 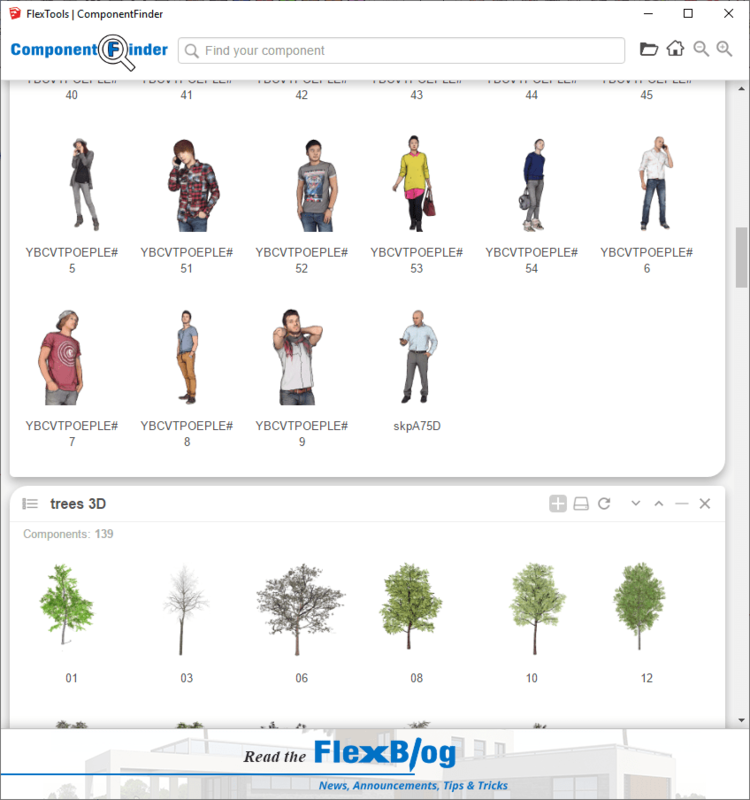 Voilla, the People-3D folder is open! Now you have a better view of where you're saving to... Click on the [+] button on the newly opened folder pane to save the component. Rename the component for easy searching. Use case example: Let's say you have a component in your library that you want to make changes to, and then save it back. Pull it in. Make your changes. Right click on the original in the ComponentFinder folder pane > Replace with selected instance => The component in the library is updated. Say Bye Bye to a component! Click on the 'Home' button to open the 'In-Model' components pane. Clicking on the button again will close the pane. 📌 Double clicking below the search field will also open and hide the In-Model pane. The In-Model pane shows you components (and groups too) that are currently in your model. It also has 2 different viewing modes, but note that they are a bit different than the regular folder pane views mentioned above. See all the components that are in the Top-Level i.e. that are not contained within any other components. To view all components, and all sub-components and groups that are in the model. Note that when this view is enabled - it can take quite a long time to fetch all the components and it can make Sketchup tremendously slow until it's done. On the bright side - You can stop the 'Fetching' any time by pressing on the button again to see Top-Level components only. Once the Fetching is done. The component thumbnails are cached in memory so the next time you open the In Model components they will load a lot faster! Usually the In-Model views will refresh automatically when new components are created/added/deleted... If for some reason something is missing, or you purged the model and the changes aren't visible, click to refresh, and you will see all the components as you would expect. Select all the instances of the component definition in the current model context. Save the component out into Window Explorer / Mac Finder. Deletes the component definition and all of it's instances in the model. When you need to search through a lot of In-Model components. Consider maximizing the In-Model pane window all the way to the bottom. This can dramatically enhance search speeds. You can double-click on the divider between the In-Model pane and the folder panes to quickly maximize the In-Model pane. This chapter is relevant to those who have saved components into their Favorites Library. Pull in each and every component from the Favorites library into an open Sketchup model, and then click on the blue [+] icon in ComponentFinder to add the selected file to a specific folder pane you've chosen. Copy each of the Sketchup component files you find in there to a folder you can easily find later, i.e. wherever you usually save all of your components. Later you can point to that folder from within ComponentFinder. 📌 There is no need to transfer icon files, or to replicate the folders structure. Once you're done with the relocation you can hide the Favorites Library buttons from the toolbar. Open the FlexTools Manager and disable their visibility. In the example below it is shown how to hide any tool or component from the toolbar.